Kidney stone formation is a complex that results from a succession of several physicochemical events including supersaturation, nucleation, growth, aggregation and retention within the kidneys. Urinary stones affect 10-12 % of the population in industrialized countries. There are only a few geographical areas in which stone disease is rare e.g. Germany and in the coastal areas of Japan. So in the present review aims to give data highlighting the present trends in research of medicinal plants accredited with antiurolithiatic activity. This article may help investigators to identify lead compounds or herbal products responsible for urolithiatic activity. INTRODUCTION: Urinary stone disease continues to occupy an important place in everyday urological practice. The average life time risk of stone formation has been reported in the range of 5-10 %. A predominance of men over women can be observed with an incidence peak between the fourth and fifth decade of life. Recurrent stone formation is a common part of the medical care of patients with stone disease 1. Calcium-containing stones, especially calcium oxalate monohydrate, calcium oxalate dihydrate and basic calcium phosphate are the most commonly occurring ones to an extent of 75-90% followed by magnesium ammonium phosphate (Struvite) to an extent of 10-15%, uric acid 3-10% and cystine 0.5-1% (4-6). In most of the cases the commonly occurring stones are calcium oxalate or magnesium ammonium phosphate type 2, 3. Many remedies have been employed during the ages to treat urinary stones. In the traditional systems of medicine, most of the remedies were taken from plants and they were proved to be useful though the rationale behind their use is not well established through systematic pharmacological and clinical studies except for some composite herbal drugs and plants. Pharmacotherapy can reduce the recurrence rate. The use of plant products with claimed uses in the traditional systems of medicine assumes importance. In India, in the Ayurvedic system of medicine, ‘Pashanabheda’ group plants, claimed to be useful in the treatment of urinary stones. ‘Pashanabheda’ is the Sanskrit term used for a group of plants with diuretic and antiurolithiatic activities (Pashana = stone; Bheda = break). Hence, in the present review an attempt has been made to enumerate the studies carried out on these plants. This could serve as a source of information on the present trends in research on plants accredited with antiurolithiatic activity 4, 5. Regulates the crystalloid colloid imbalance and improve renal function, thus prevents recurrence of urinary calculi. Reveals marked improvement in symptoms of urinary calculi like pain, burning micturition and haematuria (Analgesic and anti-inflammatory activity). Protective effect of Triterpenes on Urolithiatic Activity: Naturally occurring pentacyclic triterpenes of plant origin have been identified as possessing a wide range of pharmacological effects. Lupeol (Lupa-21, 20 (29) dien, 3b-ol) has been found to be efficient in reducing the risk of stone formation in animals by way of preventing crystal-induced tissue damage and dilution of urinary stone-forming constituents. Two structurally related triterpenes, lupeol and betulin (Lupa-20 (29) ene-3, 28 diol) were assessed for their antilithiatic effect. Foreign body implantation method followed by supplementation of ammonium oxalate was adapted to induce stone formation in the bladder. This led to elevated lipid peroxidation and depleted antioxidant status in the renal tissues. Both the triterpenes were equally efficient in minimizing crystal-induced renal peroxidative changes measured in terms of malondialdehyde and subsequent tissue damage. The antioxidant status, comprising of the enzymatic and non-enzymatic components, was found to be significantly depleted in the kidney and bladder of stone-forming animals. Both lupeol and betulin were comparable in their ability to restore the thiol status and the antioxidant enzymes like superoxide dismutase, catalase and glutathione peroxidase. The mechanism by which the two compounds render protection against oxalate-induced toxic manifestations and free radical production may involve the inhibition of calcium oxalate crystal aggregation and enhancement of the body defence systems7. Market Herbal Products with Antiurolithiatic Activity: The marketed composite herbal formulations, Cystone (Himalaya Drug Company, India), Calcuri (Charak Pharmaceuticals, Bombay, India) and Chandraprabha bati (Baidyanath, India) have been widely used clinically to dissolve urinary calculi in the kidney and urinary bladder. Pharmacological and clinical studies carried out on a composite herbal formulation, Trinapanchamool consisting of five herbal drugs namely Desmostachya bipinnata, Saccharum officinarum, Saccharum nunja, Saccharum spontaneum and Imperata cylindrica was found to be effective both as prophylactic in preventing the formation and as curative in dissolving the pre-formed stones in albino rats. The antiurolithiatic activity of this formulation has been attributed to its diuretic activity. List of plants which have been used for the treatment of urolithiasis is provided in table 1. Clinical and Pharmacology Studies: In recent years, a number of proprietary compositae herbal drugs have also been introduced for dissolving kidney calculi of which mention may be made Cystone 9 (Himalaya Drug Co. Bombay) and Calcuri (Charak Pharmaceuticals Bombay). These drugs are common use in India. Saxifraga ligueata and Tribulus terrestris are the two common plant ingredients of both these herbo-mineral preparation. Uretreic calculus disappeared within 55 days of treatment with ‘Cystone’ a herbo-mineral composition 10. Cystone relaxes the detrusor muscles and promotes diuretics by virtue of its high content of natural mineral salts. Cystone has also been found to be useful in urolithiasis, crystalluria and urinary tract infection in oral administration of other indigenous herbo-mineral drug calculi (2 TDS) in 40 cases of ureteric calculi, showed passing of disintegrated or intact stones through urine in 25 (62.85%) cases 12. Pharmacologically, Berginia ligulata has shown no effect in preventing the stone formation but was found useful in dissolving zinc calculi in the urinary bladder in experimental rats 13. Varuna, Ghokhru and Kulatha were found to be effective in preventing the deposition of the stones in experimental rates. Vataj (oxalate) and Pitiaj (urate and cystine) stones did not dissolve in varuva and kulatha. Gokhru decoctions dissolve urate and cystine stones to some extent. Kaphaj (phosphetic) stones were dissolving in all the three drugs. Among them kulatha had marked (87 %) dissolving activity and stones become friable 14. There are many herbal preparations described in Ayurvedic a text in which kulatha is the main ingredient. It has been described as Ashmarighana (Destroyer of stone) by Charak, Sushruta and Other authorities. Sushruta mentions its efficacy in vataj ashmari with the characteristics of oxalate stone. Clinical investigations have been shown that out of fifteen cases urinary calculi, nine patients passed their stones within 8-10 days of treatment with Dolichos biflorus. Spontaneous passage of stones was common depending upon the size, site and mobility of the calculus 15, 16. 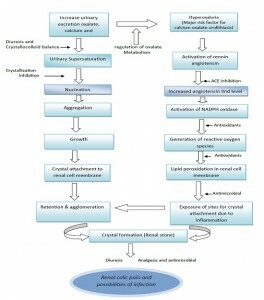 Regulates the Crystalloid Colloid Imbalance and Improve Renal Function: In urine there are a number of crystalloids of different types (oxalate, uric acid, calcium, cystine) which are kept in solution by the presence of colloids (mucin and sulphuric acid) in the urine by the process of absorption. 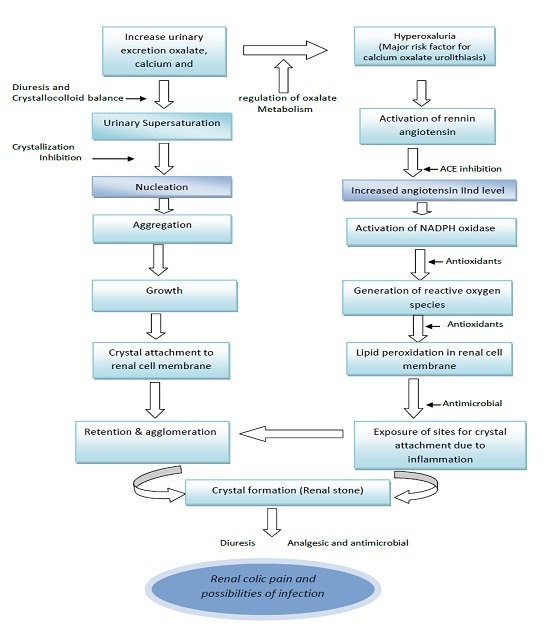 When there is imbalance in the crystalloid-colloid ratio, i.e., increase in crystalloid and fall in colloid level leading to formation of renal stones or when the colloid lose the solvent action or adhesive property, urinary stones are formed.An increase in urinary phosphorus excretion was observed in ethylene glycol induced urolithic rats. Increased excretion of phosphorus has been reported in stone formers 17. Increased urinary phosphorus excretion along with oxalate stress seems to provide an environment appropriate for stone formation by forming calcium phosphate crystals, which epitaxially induces calcium oxalate deposition. Increased excretion of uric acid has been reported in stone formers and hyperoxaluric rats. Uric acid interferes with calcium oxalate solubility and it binds and reduces the inhibitory activity of GAGS. The predominance of uric acid crystals in calcium oxalate stones and the observation that uric acid binding proteins are capable of binding to calcium oxalate and modulate its crystallization also suggests its primary role in stone formation. Supersaturation of these urinary colloids results in precipitation as crystal initiation particle which when trapped acts as a nidus leading to subsequent crystal growth. Rubia cordifolia, Aerva lanata, Moringa oleifera and Cystone (polyherbal formulation) maintain crystalloid-colloid balance by decreasing excretion of urinary calcium, oxalate, uric acid, phosphorus and protein in urolithiasis 18. Improved Renal Function: In urolithiasis, the Glomerular Filtration Rate (GFR) decreases due to the obstruction to the outflow of urine by stones in urinary system, due to this the waste products, particularly nitrogenous substances such as urea, creatinine and uric acid get accumulated in blood 19. Herbal therapy improves the renal function by increasing the excretion of urea and creatinine. Most of the phytothereupatic agent exerts their antiurolithiatic effect through this mechanism. Moringa oleifera and Rubia cordifolia significantly lower serum levels of accumulated waste products BUN and creatinine is attributed to the enhanced GFR 20. Regulate Oxalate Metabolism: Hyperoxaluria is a most significant risk factor in the pathogenesis of renal stone. It has been reported that oxalate play an important role in stone formation and has about 15-fold greater effect than urinary calcium. Increased oxalate concentration is responsible for precipitation and deposition of CaOx crystals. Aqueous extract of Tribulus terrestris interfere with the metabolism of oxalate in male rats fed sodium glycolate. Glycolate feeding resulted in hyperoxaluria as well as increased activities of oxalate synthesizing enzymes of the liver i.e., glycolate oxidase (GAO), glycolate dehydrogenase (GAD) and lactate dehydrogenase (LDH) and decreased kidney LDH activity. T. terrestris administration to sodium glycolate fed rats produced a significant decrease in urinary oxalate excretion, and a significant increase in urinary glyoxylate excretion, as compared to sodium glycolate fed animals and similar results were observed for Aerva lanata 21. Antioxidant Activity (Free- Radical Scavengers/ Membrane Stabilization): Renal cellular exposure to oxalate (Ox) and/or CaOx crystals leads to the production of Reactive Oxygen Species (ROS), development of oxidative stress followed by injury and inflammation. Renal injury and inflammation appear to play a significant role in stone formation. An overproduction of ROS and a reduction in cellular antioxidant capacities, due to down-regulated expression of the antioxidant enzymes (superoxide dismutase, catalase, glutathione peroxidase, and glucose-6 phosphate dehydrogenase) as well as radical scavengers (vitamin E, ascorbic acid, reduced glutathione) leads to the development of Oxidative Stress (OS) 22. Oxidative stress followed by renal cell injury and inflammation due to lipid peroxidation. Loss of membrane integrity subsequently facilitates the retention of calcium oxalate crystals and growth of stones in renal tubules. Recent studies have provided evidence that CaOx kidney stone patients malondialdehyde (MDA) in their urine, indicating ROS in kidneys of CaOx stone patients. Urinary excretion of these MDA is considered as a marker of renal epithelial cell injury 23. Recent studies evidenced that treatment with anti-oxidants and free radical scavengers reduced CaOx crystal induced renal injuries. Pre-treatment with vitamin E along with mannitol abolished the deposition of CaOx crystals in the kidneys of rats injected with sodium oxalate. Alanine-induced deposition of CaOx crystals in rat kidneys was blocked by dietary supplementation with vitamin E plus selenium. These antioxidant therapies restore the activity of antioxidant enzymes and free radical scavengers. Therefore, treatments with natural antioxidants and free radical scavengers, seems to possible therapeutic strategy for ameliorating hyperoxaluria induced oxidative stress and renal cell injury in urolithiasis. Herbal medicine or plants are rich source of natural antioxidants, can be used in treatment of hyperoxaluria induced oxidative stress and urolithiasis. Protective effect of Paronychia argentea, B. ligulata and Trachyspermum ammi in hyperoxaluric oxidative stress and CaOx crystal deposition is due to their potential antioxidant activity. Quercus salieina, Achyranthus Aspera, Amni visnaga and Mimusops elengi showed reduction in oxalate-induced renal tubular epithelial cell injury in cell culture due to their antioxidant activity 24, 25, 26. Inhibition of ACE/Phospholipase A2: ROS are produced from many sources and involve a variety of signalling pathways. Animal model studies have provided evidence for the hyperoxaluria-induced activation of the Renin-Angiotensin System (RAS); a major player in renal disease progression. RAS activate the NADPH oxidase in renal cells which is responsible for ROS production. Reduction of angiotensin II production by inhibiting ACE or blocking angiotensin receptors has been shown to significantly reduce renal CaOx crystal deposition as well as the development of interstitial inflammation. The ROS culminate phospholipase A2 activation through transcription factor NF--KB (nuclear factor NF-KB) as NF-KB can be activated by the stress of oxidants 27 and oxalate exposure also promotes rapid degradation of IxBa (an endogenous inhibitor of the NF-KB). The inhibition of the lipid peroxidation (decrease MDA level) after post treatment of plant extract can be attributed to decreased production of ROS due to inhibition of ACE or indirect inhibition of phospholipase A2 through inactivation of NF--KB. Many antioxidant constituents of plants like flavonoids reported to inhibitory activity on NF-KB gene expression. Some plants with antiurolithiatic property also reported to have ACE inhibition activity28. Antimicrobial Property: Another antilithogenic effect of some herbal remedies is due to antimicrobial properties. It must be emphasized that a deficit in the crystallization inhibitory effect of urine and the presence of promoters are considered the most important risk factors in the process of urinary stone disease. When these conditions favour stone formation, the anti-adherent layer of GAGS acts as a protective barrier against urinary stone disease. If this layer is damaged, as a consequence of bacterial attack, a stone nucleus might develop, leading to a full stone in the urinary tract. At this point, some extracts that show antimicrobial properties can be considered antilithogenic by protecting the anti-adherent glycosaminoglycan layer covering the epithelium of the collecting system 29. Renal stones often accompanied by infection (DTI's). Renal stones also contain matrix, a non-crystalline material. Then matrix content of a stone may be between 10 and 65% by weight and tends to be higher when there is an associated urinary tract infection. It has been suggested that alteration in the secretion of renal enzymes (decreased urokinase and increased sialidase) may increase matrix formation. Certain bacteria such as Proteus mirabilis and Escherichia cob:, alter urokinase/sialidase activity leading to matrix formation, in turn causing increased crystal adherence to the renal epithelium. Cystone also found to be effective in urinary tract infection and infective stones along with urolithiasis 30. Analgesic and Anti-Inflammatory Activity: A patient with renal or ureteric colic from an obstructing stone typically presents with sudden onset of acute loin pain, often at night when the urine is maximally concentrated. Renal colic may be sudden or gradual in onset. The pain typically rises to a crescendo, causing the patient to writhe around and be unable to find a comfortable position 31. In a clinical study, patients treated with Cystone reported a significant symptomatic relief from abdominal pain and dysuria. There was a significant reduction in the mean number of pain episodes from baseline to the end of the therapy. Cystone exhibited a good spasmolytic activity on the smooth muscles of the rabbits and guinea pigs 32. Solidago virgaurea and Phyllanthus niruri have their beneficial action in urolithiasis due to anti-inflamatory effect 33. The effect of nurvala bark decoction on calcium oxalate urolithiasis induced by 3% glycolic acid has been studied in rats. The decoction showed significant activity in preventing the deposition of calcium and oxalate in the kidney by inhibiting the activity of the Liver enzyme glycolic acid oxidase. Treatment with C. nurvala bark decoction was reported to lower the levels of intestinal NaZ, KZ-ATPases 34. Investigations on the effect of Ammi visnaga seeds on kidney stones revealed that the antilithiatic effect is mainly because of highly potent diuretic activity and amelioration of uraemia and hyperbilirubinemia by seeds of Ammi visnaga 35. Phyllanthus niruri has an inhibitory effect on crystal growth, in a rat model of urolithiasis induced by introduction of calcium oxalate seed in bladder of rats. The effect may be due to higher Levels of glycosoamino glycans incorpated into calculi 36. In vitro studies in which calcium oxalate precipitation was induced by addition of 0.1 M sodium oxalate to unfiltered urine samples from Wistar rats and normal humans in absence and presence of niruri extract (0.25 mg/ml), suggested that extract may interfere with early stages of stone formation 37. Fourteen patients with renal calculi and 16 patients with ureteric calculi have been treated with the herbomineral combination containing Bergenia ligulata and Tribulus terrestris. 28.57% of patients with renal calculi and 75% patients with ureteric calculi passed their calculi completely and in other patients there was a marked or partial expulsion of calculi along with changes in the shapes and sizes of calculi 38. The effect of ingestion of 3 and 10 g of tamarind pulp (Tamarindus indicus) was studied in normal subjects and in stone formers. Tamarind intake at the dose of 10 g showed significant beneficial effect in inhibiting spontaneous crystallization in both normal subjects and in stone formers 39. Costus spiralis is extensively used in Brazilian folk medicine for expelling urinary stones. Aqueous extract of spiralis when used at a dose of 0.25 and 0.5 g/kg / day for 4 weeks significantly reduced the growth of calcium oxalate calculi in the urinary bladder of rats 40. Antiurolithiatic activity of two compounds viz., 7-hydroxy­2L, 4', 5L-trimethoxyisofLavone and 7-hydroxy-4L-methoxy isoflavone isolated from the heart wood of Eysenhardtia polystachya was studied in rats by observing calculus formation experimentally induced by zinc discs. A significant decrease in urinary stone size was observed in animals treated with these compounds 41. Experimental studies carried out on Crataeva nurvala, Tribulus terrestris and Dolichos biflorus showed them to be effective in preventing the deposition of stone material on glass beads in the urinary bladder of rats 42. All the three plants were shown to dissolve phosphate type of calculi in an in vitro model, where as oxalate, uric acid and cystine stones were not dissolved by nurvala and D. biflorus extracts. T. terrestris dissolved uric acid and cystine stones to some extent. Clinical studies carried out on C. nurvala showed that it changes the urinary chemistry of patients and thus it reduces the Lithogenic potential 43. The aqueous extract of Melia azedarach was studied against ethylene glycol induced nephrolithiasis in male albino wistar rats. The aqueous extract of M. azedarach reduced urinary calcium, oxalate, phosphate and elevated urinary magnesium levels and urine volume 44. The seeds of Dolichos biflorus and rhizomes of Bergenia ligulata were tested for their in vitro antilithiatic and anticalcification activity by the homogenous precipitation method. The extracts were compared with an aqueous extract of cystone (a marketed preparation) for their activities. Also a combination of the extracts of the two plants was tested. Extracts of Dolichus biflorus showed activity almost equivalent to cystone while Bergenia ligulata showed less activity and the combination was not as active as the individual extracts 45. Phycocyanin a known antioxidant is reported to have potential antiurolithiatic activity as it reduces oxalate levels in kidney tissue significantly 46. The aqueous extract of Raphanus sativus showed antilithiatic activity on implants of calcium oxalate crystals or zinc discs in the urinary bladder of rats. The effect however is unrelated to increased diuresis or to a change of the muscarinic receptor affinity of the bladder smooth musculature to cholinergic ligands 47. The efficacy of the two Siddha drugs, Aerva lanata and Vediuppu chunam as antilithic agents were studied in rats using 0.75% ethylene glycol in drinking water as a urolithic rat model 48. The ethanolic extract of Asparagus racemosus had an inhibitory potential on lithiasis induced by oral administration of 0.75% ethylene glycolated water to adult male Albino Wistar rats for 28 days. The ethanolic extract, significantly reduced the elevated level of calculogenic ions in urine and it elevated the urinary concentration of magnesium, which is considered as one of the inhibitors of crystallization 49. The fresh juice of Leaves of Plectranthus amboinicus has effect against renal calculi particularly of calcium oxalate origin induced by administration of 1% ethylene glycolated water 50. The aqueous and alcoholic extracts of the root wood of Moringa oleifera significantly reduced the elevated urinary oxalate, showing a regulatory action on endogenous oxalate synthesis in hyperoxaluria induced with ethylene glycol 51. CONCLUSION: As the present review illustrates, a number of medicinal plants are evaluated mainly against calcium oxalate and magnesium ammonium phosphate types of kidney stones, employing various experimental models of urolithiasis. Most of these studies were preliminary, carried out in animals and are not sufficient for the development of a pharmaceutical product. Still, intensive preclinical and clinical studies are required to evaluate the efficacy and toxicity of these plant products. Further, chemical studies of the plants are needed to isolate the active principles and investigate them in order to identify a promising Lead compound. Currently, in the management of urinary stones surgical procedures and extra corporeal shock wave Lithotripsy are commonly employed. The major drawback of these procedures is recurrence of stones. The plant products and derivatives of their Lead compounds as such may not replace these procedures but may surely help in decreasing the recurrence rate of renal calculi. The main drawbacks in the development of a standard drug may be the multicausaL nature of uroLithiasis, different biochemical disorders that Leads to urolithiasis and different chemical varieties of renal stones. Tiselius HG, Ackermann D, Alken P, Buck C, Conort P, Gallucci : Guidelines on urolithiasis 2001; 40: 362-371. Otnes B; Quantitative observations on crystalline composition of urinary stones. Scan. J. Urol. Nephrol. 1983; 17: 185-190. Williams HE and Wandzilak TR. Oxalate synthesis, transport and the hyperoxaluric syndromes. J. Urol., 1989; 141: 742. Narayana swami V and Ali VS. Pashanabheda. J. Res. Indian. Med. 1967; 1: 24. Bahl and Seshadri Advances in research in “Indian Medicine”, “Pashanbedi” drugs for urinary calculus, Udupa, K.N. (Eds),: 1970 : 77-98. Barry H, Antioxidant effects: A basis for drug selection. Drugs, 1991; 42: 569-605. Malini MM, Lenin M, and Varalakshmi P., Protective effect of triterpenes on calcium oxalate crystal-induced peroxidative changes in experimental urolithiasis, 2000; 41: 413-418. Singh CM and Sachan SS. Management of urolithiasis by herbal drugs. J. Nepal. Pharm. Assoc. 1989; 7: 81-85. Jehti RK, Duggal B, Sahota RS, Gupta M and Sofat JB: Important plants used in stone. India J Med Res 1983; 78: 422-25. Muthusamy VV and Muthu P: Usefulness of history- taking, Physical examination and diagonistic scoring in acute renal colic, Prove 1980; 19: 130-131. Yadav JK, Singhvi AN and Sharma N: Indigenous herbomineral drug calcuri. Med. Surg 1981; 21: 15-18. Seth SDS, Prabhakar MC, Bupha BC and Arora RB: Berginia ligulata as a antilithiatic. J. Res. Indian Med 1974; 9: 1-3. Kumar P, Despande PJ and Singh LM: Kidney stone dissolving drugs. Bull. Med. Ethanobot. Res. 1981; 2: 277-84. Singh LM and Kumar P: Pharmaceutical preparation described in Ayurvedic texts. J. Res. Ind. Med. 1973; 8: 1-7. Havagiray RC, Shashi A, Jain SK, Sabharwal M: Herbal treatment for urinary stones. International Journal of Pharmaceutical Sciences and Research. 2010; 1: 24 – 31. Soundararajan P, Mahesh R, Ramesh T and Hazeena Begum V; Effect of Aeruct lanata on calcium oxalate urolithiasis in rats. Indian J. Exp. Biol., 2006; 44: 981-986. Karadi RV, Gadgeb NB, Alagawadi KR and Savadi RV, Effect of Moringa oleifera L. root-wood on ethylene glycol induced urolithiasis in rats. J. Ethnopharmacol., 2006; 105: 306-311. Ghodkar PB, Chemical Tests in Kidney Disease. In: Textbook of Medical Laboratory Technology, Sood, M.S. (Ed.). Bhalani Publishing House, Mumbai, 1994; 118. Divakar K, Pawar AT, Chandrasekhar SB, Dighe SB and Divakar G; Protective effect of the hydro-alcoholic extract of Rubia cordifolia roots against ethylene glycol induced urolithiasis in rats. Food Chem. Toxicol, 2010; 1013-1018. Sangeeta D, Sidhu H, Thind SK and Nath R, 1994. Effect of Tribulus terrestris on oxalate metabolism in rats. J. Ethnopharmacol., 1994; 44: 61-66. Khan SR, 2005. Hyperoxaluria-induced oxidative stress and antioxidants for renal protection. Urol. Res., 2005; 33: 349-357. Selvam R, Kalaiselvi P, Govindaraj A, Murugan VM, Satish Kumar AS, Effect of A. lanata leaf extract and Vediuppu chunnam on the urinary risk factors of calcium oxalate urolithiasis during experimental hyperoxaluria. Pharmacology, Res., 2001; 43: 89-93. Aggarwal S, Tandon S, Singla SK and Tandon C, Reduction of oxalate induced renal tubular epithelial cell (NRK-52) injury and inhibition of calcium oxalate crystallization in vitro by aqueous extract of Achyrenthes aspera. Int. J. Green Pharm., 2010; 4: 159-164. Atmani F, Farell G and Lieske JC, Extract from Herniaria hirsute coats calcium oxalate monohydrate crystals and blocks their adhesion to renal epithelial cells. J. Urol., 2004; 172: 1510 -1514. Bahuguna YM, Rawat MSM, Juyal V and Gusain K, Evaluation of Pyracantha crenulata Roem for antiurolithogenic activity in albino rats. Afr. J. Urol., 2010; 15: 159-166. Siebenlist U, Franzoso G and Brown K, Structure, regulation and function of NF‑ KB. Ann. Rev. Cell Biol., 1994; 10: 405-455. Toblli JE, Ferder L, Stella I, De Cavanagh MVE, Angerosa M and Inserra F; Effects of angiotensin II subtype 1 receptor blockade by losartan on tubulointerstitial lesions caused by hyperoxaluria. J. Urol., 2002; 168: 1550-1555. Sellaturay S and Fry C. The metabolic basis for urolithiasis. Surgery; 2008; 26: 136-139. Kumaran MGS, Prasad SR and Mitra SK; Evaluation of efficacy and safety of cystone syrup in lower ureteric calculus. Indian J. Clin. Prac., 2007; 18: 31-36. Leye A, Jaeger P, Robertson W and Unwin R; Renal stone disease. Medicine, 2007; 35: 415-419. Phukan DP, Deka A and Choudhury AK; Pharmacological and clinical study on cystone. Probe, 1977; 17: 25-29. Melzig MF, Goldenrod-a classical exponent in the urological phytotherapy. Wien. Med. Wochenschr., 2004; 154: 523-527. Varalakshmi P, Shamila Y, Latha E. Effect of Crataeva nuruala in experimental urolithiasis. J. Ethnopharmacol. 1990; 28: 313-321. Khan ZA, Assiri AM, Al-Afghani HM and Magharbi TM. Inhibition of oxalate nephrolithiasis with Ammi visnaga (Ai-Khillah). Int. Urol. Nephrol. 2001; 33: 605-608. Freitas AM, Schor N and Boim MA. The effect of P. niruri on urinary inhibitors of calcium oxalate crystallization and other factors associated with renal stone formation. B. J. Urol. International. 2002; 89: 829 (2002). Barros ME, Schor N and Boim MA. Effect of an aqueous extract from P. niruri on calcium oxalate crystallization in vitro. Sannidi DN, Anil kumar and Naresh kumar. To evaluate the effect of Ayurvedic drugs Sveta parpati with pashanabheda and Gokshura in the management of Mutrasmari (Urolithiasis). Proceedings of National Science Council, Part B, Life sciences, 1997; 21: 13-19. Rathore P, Pendse AK, Handa S, Sharma K and Singh PP. Effectiveness of Tamarind (Tamarindus indicus) therapy ( 3 gm and 10 gm) on calcium oxalate and calcium phosphate crystallization using three different methods. Indian. J. Clinical. Biochem., 1993; 8: 136-143. Viel TA, Cristina D, Da Silva Monterio AP, Lima-Landman MTR, Lapa AJ and Souccar C. Evaluation of the antiurolithiatic activity of the extract of Costus spiralis Roscoe in rats. J. Ethnopharmacol. 1994; 66: 193-198. Perez RM, Vargas R, Perez G, Zavala. S., Perz CG. Antiurolithiatic activity of 7-hydroxy-2',4’,5'-trimethoxyisoflavone and 7-hydroxy-4'- methoxy isoflavone from Eysenhardtia polystachya. Journal of Herbs, Spices and Medicinal Plants. 2000; 7: 27-34. Pramod K, Despande PS and Singh CM. Studies on urolithiatic action of Indigenous drugs. Bull. Med. Ethnobot 1981; 2: 277-284. Deshpande PJ, Sahu M and Pradeep kumar. Crataeva nurvala Hook and Frost (Varuna). The Ayurvedic drug of choice in urinary disorders. Indian. J. Med. Res. 1982; 70: 46-53. Garimella TS, Jolly CI, Narayanan S; In vitro studies on antilithiatic activity of seeds of Dolichos biflorus Linn. and rhizomes of Berginia ligulata Wall. Phytotherapy research. 2001; 15: 315-355. Farooq SM, Preventive role of phycocyamin: A study of oxalate mediated renal cell injury. Chemico -Biological Interactions. 2004; 149: 1-7. Vargas SR, Perez GRM, Perez GS, Zavala SMA, Perz GC: Antiurolithiatic activity of Raphanus sativus extract on rats. J Ethnopharmacol. 68: 335-33 8. Selvam R, Kalaiselvi P, Govindaraj A, Balamurugan V, and Satish Kumar AS; Effect of Aerva lanata leaf extract and vediuppu chunnam on the urinary risk factors of calcium oxalate urolithiasis during experimental hyperoxaluria. Pharmacol. Res. 2001; 43: 89-93. Christina AJ, Ashok K, Packialakshmi M, Tobin GC, Preethi J and Murugesh N. Antilithiatic effect of Asparagus racemosus Willd on ethylene glycol-induced Urol. Res. 2003; 30: 374-379. Alvin Jose M, Ibrahim S and Janardhan. Modulatory effect of Plectranthus amboinicus Lour on ethylene glycol induced nephrolithiasis in rats. Indian. J. Pharmacol. 2005; 37: 43-45. Karadi RV, Gadge NB, Alagawadi KR and Savadi RV. Effect of Moringa oleifera Lam. Root wood on the ethylene glycol induced urolithiasis in rats. J. Ethnopharmacol. 2006; 105: 306-311. Christina AJ, Haja Najumadeen NA, Vimal Kumar S, Manikandan N, Tobin GC, Venkataraman S and Murugesh N. Antilithiatic Effect of Melia azedarach on Ethylene Glycol-Induced Nephrolithiasis in Rats. Pharmaceutical Biology. 2006; 44: 480- 485.